This 1950’s solid 14k. solid gold ladies OMEGA is an interesting and rare cocktail watch. Notice the four sparkling (authentic) diamonds. these are NOT tiny stones-they do really catch the eye! The time is set by gently pulling up the crown on the case back with your two finger nails on both sides of the crow. Winding is done as normal, also on the case rear. I do love the engine turned detail on the case rear, as well as the original winding crown signed twice. The dial is original, as is the faceted glass crystal. The manual winding OMEGA movement was just cleaned and is accurate. 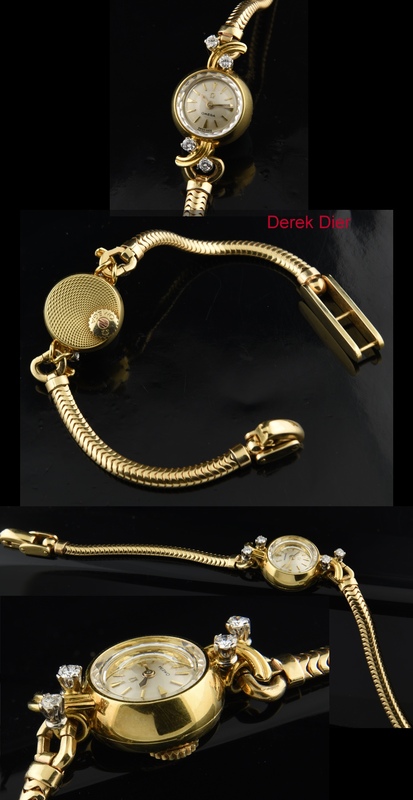 This is a dainty watch, with the solid gold head measuring 15.5mm. These watches were meant to be smaller and discreet from this era. The solid 14k. gold serpentine bracelet is heavy and EXQUISITE! The signed 14k. gold bracelet was likely (expensively) added when the watch was new-not signed OMEGA but definitely upgraded the look and feel of this amazing vintage OMEGA. I bought this OMEGA from the family of the original owner, who said their mom barely wore it-only special occasions…and you can tell, as it looks new. 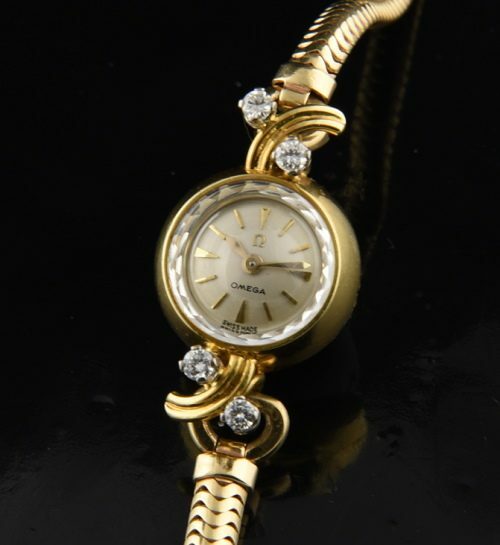 This solid gold OMEGA cocktail watch watch will fit a 6.25 inch wrist or less. An amazing piece!